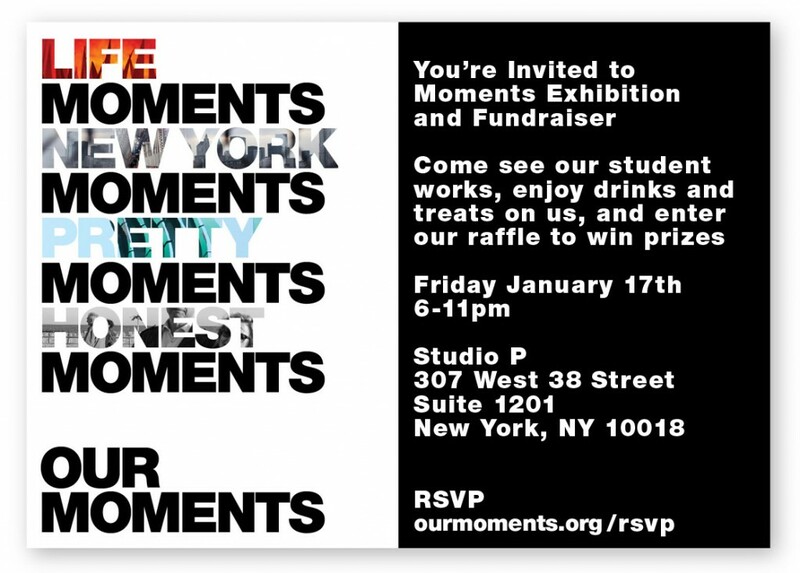 Moments would like to invite you to our exhibition fundraiser January 17th, 2014 from 6-11pm. Drinks are on us so come check out some great work, have fun, and meet the students. Space is limited so entrance can only be secured by making a suggested minimum donation of $25 via paypal or by RSVPing here and paying what you wish at the door. Sponsorship has been graciously provided by Studio P, Eileen’s Cheesecake, Brooklyn Brewery, Tuthilltown Spirits, Adorama Pix, Alchemy Creamery, Kristi Vosbeck, SUDA-NYC, and services by Stephanie Albaracin and Selda Cortes.